◆USB3.0 Technology features strong error-correcting ability, anti-shock and noise reduction technology, low power consumption. ◆For the desktops, please connect the device to the USB port of the motherboard for normal use. This external CD Drive supports to read CD,VCD,SVCD,CD-R,CD-RW,DVD-R/DVD-RW and write CD-RW,CD+RW,DVD-RW,DVD+RW etc. Compatible with windows 2000/XP/2003/Vista/7/8.1/10, Linux and all version Mac OS systems, supports any PC, Ultrabook and Netbook. 2.This drive is not fully compatible with computers of windows 10 system due to the compatibility issues between windows 10 itself and the external hardwares. We suggested that you download VLC Media player to Play DVD and CD. 3.Please be sure your computer has a Media Player before using the CD-ROM drive. Please feel free to contact us if you meet any problem. ▲External DVD Drive is a perfect companion for computers without the internal drive. You can burn files, install software and create a backup CD. It is backwards compatible with USB 2.0. ▲Easy to Use: Plug and play, powered by the USB port, no external power and driver required. With USB 3.0 transmission, providing faster data transfer rates., smaller resistance, stronger shielding capability, more stable data transmission. ▲Fashion and Elegant Design: Yododo External CD Drive with embedded cable design, made with premium wire drawing material, super CD/DVD Drive has a slim, lightweight, compact, portable body. ▲Professional Performance: Support CD-R, CD-RW, DVD-R, DVD-R DL, DVD-RW, DVD+R, DVD+R DL, DVD+RW, DVD-RAM, DVD-ROM, CD-ROM, strong error-correcting ability, anti-shock and noise reduction technology, low power consumption. 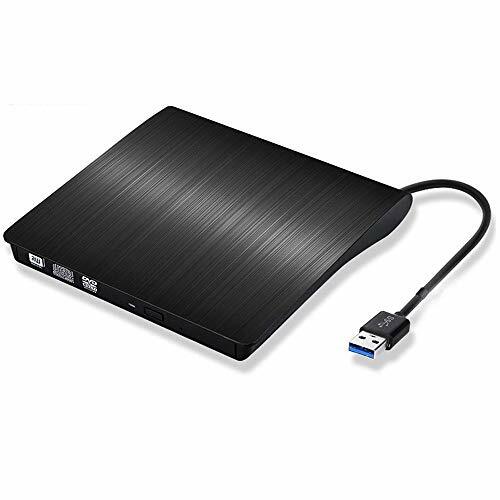 ▲Universal Compatibility: This USB 3.0 External CD Drive compatible with Windows Windows XP / 2003 / Vita / 7 / 8 / 8.1 / 10, Linux and Mac 10 OS System. (NOTE: NOT Blu-ray Drives)Support Laptop, Notebook, PC, Desktop Computer. If you have any questions about this product by Yododo, contact us by completing and submitting the form below. If you are looking for a specif part number, please include it with your message.